Introduction: The Mountain Pygmy Owl is a tiny owl with a finely spotted crown and no ear-tufts. Typical call - Barfoot Junction, Arizona, USA. May 2009. CC Andrew Spencer. Description: Facial disc is pale brownish or rufous, speckled lighter and darker. They have narrow whitish eyebrows. The crown is finely speckled whitish or pale buff. The Iris of the eyes is yellow, the Cere is yellowish-grey and bill is horn-yellow. The nape has two large dark spots that are edged in buffish-white above and pale cinnamon-buff below - these create the illusion of eyes on the back of the head. Upperparts have greyish-brown or dark brown general colouration. The mantle and back have whitish and buffish spots. The outer webs of the scapulars are partly spotted whitish or pale cinnamon-buff. The Mountain Pygmy-Owls' Flight feathers are barred light and dark, while the tail is brown to rufous with five or six narrow whitish bars. Underparts are off-white to whitish-buff, with a plain area from the throat to lower breast. The sides of the upper breast and parts of the flanks are mottled brown or rufous and whitish. The rest of the underparts are streaked dusky. Tarsi are feathered and the yellowish-grey toes are bristled, ending in brownish-horn claws with dark tips. Size: Length 15-17cm. Wing length 82-98mm. Tail length 57-64mm. Weight 48-73g. Females are generally larger and heavier than males. Habits:Although partly diurnal, the Mountain Pygmy Owl is mostly active at dusk and dawn. Voice: The Male's song is a mostly prolonged irregular series of short staccato notes, given in double hoots with some single notes included - gewgew-gewgew-gewgew-gew-gew-gewgew-gew... It often starts hesitantly with a rapid, slightly ringing sequence of notes. Young owls beg with a chipping twitter. Hunting & Food: The Mountain Pygmy Owl mainly feeds on insects, especially grasshoppers, locusts, crickets and beetles. They will also feed on small mammals, birds and reptiles. Breeding: Not well known, but likely similar breeding habits to other north American Pygmy Owls. Nests in holes in trees, especially woodpecker holes. 2-4 white eggs are laid, which are incubated by the female alone, while the male supplies the food. Chicks hatch generally at the same time. 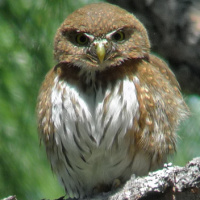 Habitat: Mountain Pygmy Owls live in Pine-oak, pine and humid pine-evergreen forests in mountainous regions from about 1500 to 2500m. 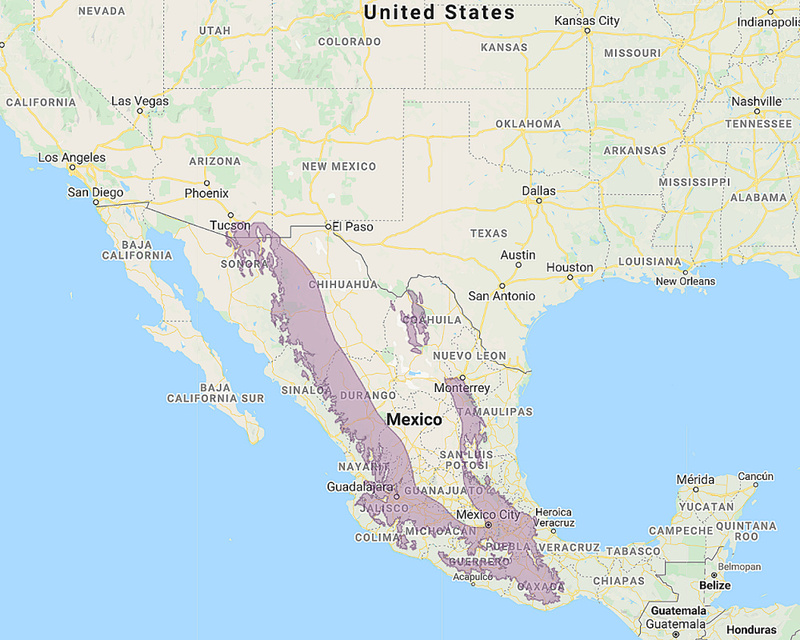 Distribution: Highlands of North and Central Mexico, from Chihuahua, Nuevo León and Tamaulipas south to Oaxaca. Northernmost limit likely extends to the mountains of southern Arizona and New Mexico. Original Description: Wagler, Johann Georg. 1832. Isis, oder Encyclopädische Zeitung, von Oken 25, col. 275.